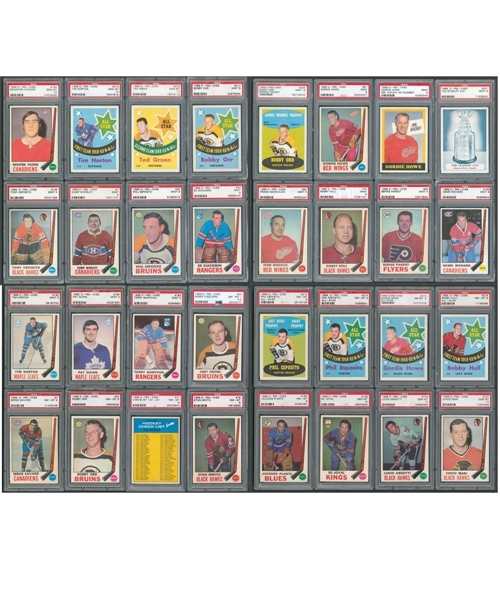 A hobby happening that will have lovers of high grade 1969-70 O-Pee-Chee hockey cards particularly intrigued is the auctioning of this complete PSA-graded set, the cards’ blue backs challenging indeed. This years-in-the-making assembly is currently the fifth finest on the PSA Set Registry. With an 8.91 Set Rating, the encapsulated bonanza includes just four examples below NM-MT 8, while boasting 18 cards which received GEM MT 10 recognition, along with another whopping 143 examples at MINT 9. The collection is being offered as a set, as well as in 80 sub lots, with further details below. There are 58 cards that are second-to-none PSA chart-toppers. The GEM MT 10 contingent is highlighted by #s 165-Rogie Vachon (Pop 5), 213-Tim Horton All-Star (Pop 8) and 218-Ted Green All-Star (Pop 5). Notable MINT 9s with none higher on their respective lines of the PSA Population Report include 1-Worsley (Pop 9), 5-J.C. Tremblay, a run of Bruins numbered from 26-Bucyk to 30-Esposito, 33-Giacomin, 99-Desjardins RC, 110-Binkley, 163-Richard, 186-Quinn RC, 210-Savard Conn Smythe and 224-Hart Trophy. The MINT 9 lineup is led by a Tony Esposito RC (just one ever graded higher by PSA), Bobby Orr’s Norris Trophy (#209) and All-Star (#212) cards, Gordie Howe’s regular (#61) and (no number) Mr. Hockey cards and the last card; 231-The Stanley Cup. Other noteworthy MINT 9s are 1-Worsley, 30-P. Esposito, 70-Hull, 89-Parent, 182-Horton and 189-Sawchuk. NM-MT 8s include 4-Savard RC, 24-Orr, 31-2nd Series Checklist, 180-Plante and All-Star cards of Espo, Howe and Hull. There are three NM-MT+ 8.5s, including 22-Cheevers, while lower than 8 are two NM 7s; 220-Beliveau All-Star and 223-Art Ross Trophy and two EX-MT 6s; 132-1st Series Checklist and 193-Howe Mr. Hockey (with number). All individual cards and their grades are listed on the PSA Set Registry. Formidable ensemble offers oodles to check and ponder before checking back with us. Good luck with these first-rate encapsulated classic collectibles. ***Please note that at the end of the auction, the set will be sold to the highest aggregate bidding, whether that is the sum of the 80 lots it was divided into or the highest bid for the complete set. Our website will automatically reflect whichever portion has received the highest bidding total.